Even though the documentary never aired, Fantasy Records and Vince Guaraldi went ahead and released the album, introducing the world to "Linus and Lucy," now instantly recognized as "the Peanuts theme." Several other themes on the LP, such as "Charlie Brown Theme" and "Baseball Theme," also appear regularly in the early Peanuts animated specials. This May, Concord Music - the modern owners of the Fantasy label - is releasing two different 50th anniversary editions of the A Boy Named Charlie Brown album, one on vinyl and one on CD. Both feature newly remastered tracks of the original album music. The "limited edition, collectible" vinyl may be of the most interest - it will be a faithful reproduction of the 1964 LP release, featuring the album's original cover (the artwork was completely replaced for later LP and and CD releases), the original liner notes in a gatefold jacket, and reproductions of the dozen 8" x 10" lithographs that came with the album. On top of that, it will be pressed on orange vinyl (which may not be authentic to the original, although Fantasy did have a tradition of releasing albums on colored vinyl in the 1960's). However, the LP will only feature the nine tracks that were originally released in 1964. The CD release will sport the modernized cover (same as the current CD) and a less elaborate booklet, but it will include new liner notes by Guaraldi historian (and FiveCentsPlease.org co-author) Derrick Bang, and 11 tracks - the original nine from the LP; "Fly Me to the Moon," a bonus track that has been part of all CD releases of the album; and a new bonus track, an alternate take of "Baseball Theme." Derrick's new liner notes will only appear with the CD, and the bonus tracks will also only be on the CD. 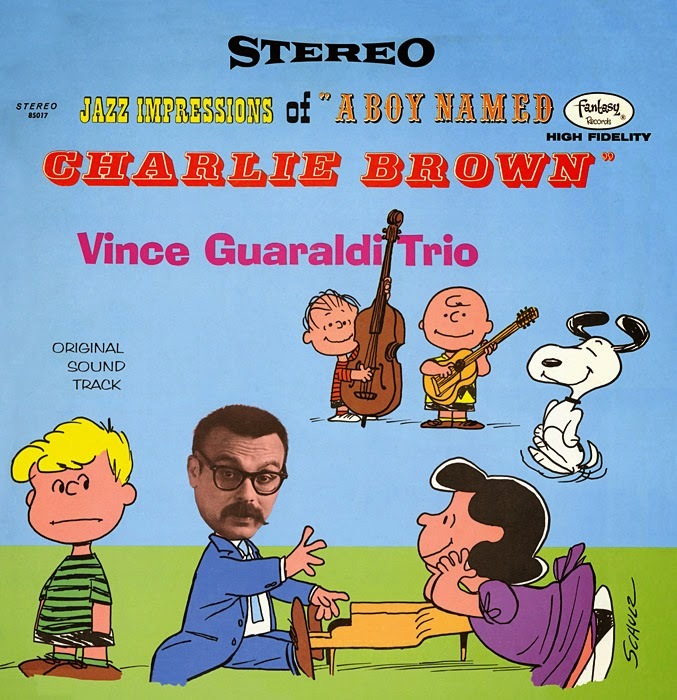 It sounds like dedicated Vince Guaraldi fans will want (need?) to buy both releases, which are due out on May 13, 2014. The vinyl edition should be available from Amazon, CDUniverse, or any other music store willing to order and stock it. For more information, see the Concord press release and Derrick's posts about the release at his Impressions of Vince blog - both his initial announcement and then his detailed description of the LP facsimile edition.